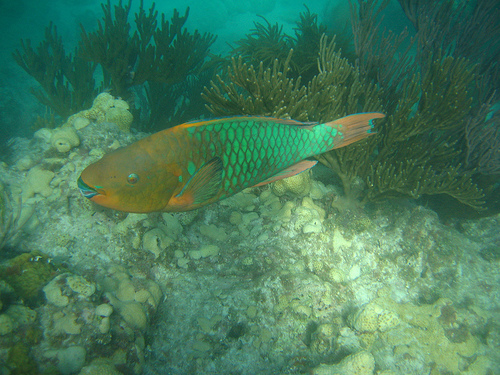 This is an adult rainbow parrotfish about 26 inches. Video by Rod 23 Jan 2010 in about 30 feet water. 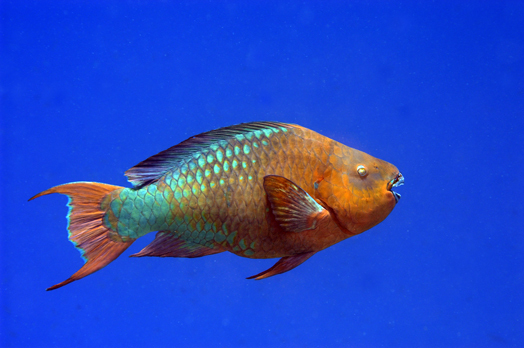 I am completing a manuscript for publication in the scientific literature entitled the Evolution of Parrotfishes. We have data for 92% of the known species and have an analysis which shows their genetic relationships. I am seeking your permission to use the image of Scarus guacamaia at http://bigelowsociety.com/fish10a/parrot97.htm to illustrate the complexity of relationships in the tropical Atlantic species. The closest relative is Scarus coelestinus with a totally different colour pattern. We are developing an argument as to how this came about. Use of the image will be fully acknowledged and is for scientific and educational purposes only. Howard Choat; James Cook University.